Photography became increasingly important for me, transitioning from a way to document holidays to a way to express myself, particularly during difficult times. It has only been in 2015 that I felt the need to take my skills to the next level. I got my first DSLR camera but had no experience in using it, so I joined an intense and insightful level 1 weekend workshop at London School of Photography. A few months later, I continued with the level 2, where I learnt how to look at photographs and understand what makes a photo a good one. Both workshops left me with great curiosity into exploring the work of others, and willing to develop my own style. Photography is not my main occupation – I am a User Experience designer who helps designing interfaces – but nonetheless it represents a very important facet of my life. In an overly dramatic fashion, I use to say that photography helps keeping me sane, but that’s not so far from the truth. Focussing on taking pictures has helped me in coping with anxiety and a bout of depression. When trying to get a picture right, I am concentrated on the here and now, which is exactly what helps keeping my anxiety at bay. During the last year or so, some of my photos have been selected to be exhibited among the work of very talented people. It humbled me, and helped building confidence in my skills at the same time. I am not sure of what will be of my photography. Surely, I will continue to be inspired by the people I am crossing paths with, and will go on taking pictures. I am grateful to the people at Shutter Hub, who always encouraged me to show my work, and to the London School of Photography for their insightful courses and the advices of their passionate teachers. My photo “The Day I Glimpsed Inside Your Soul” is currently part of the Shutter Hub Open Exhibition, at the Retina Scottish Photography Festival. 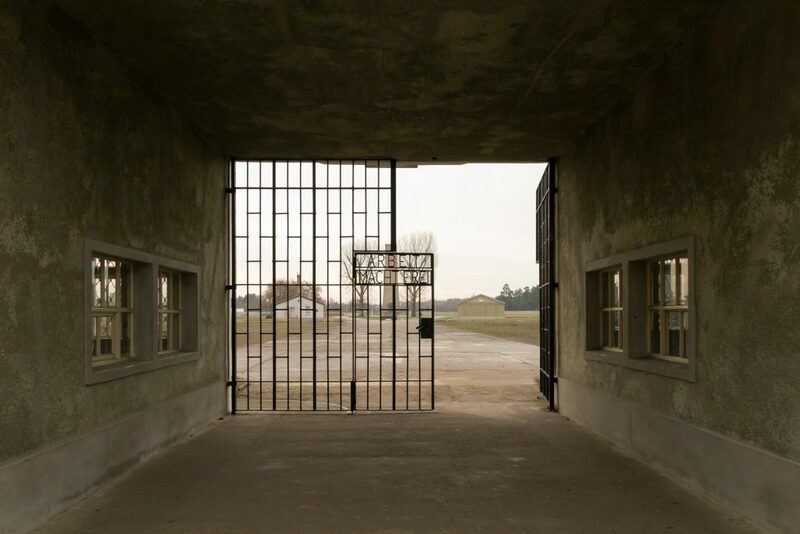 The photo tells the story of thousands of people who walked through the gate of Sachsenhausen concentration camp in Oranienburg, on the outskirts of Berlin. Sadly, for too many of them it was a one way journey. Others were lucky enough to live through it. My husband’s grandfather was one of them. He managed to escape from the camp, a few weeks before the Red Army stormed into Berlin. Without looking back, he started the long journey that eventually brought him back home in Italy, after five years of imprisonment. The photo tells a personal story too, of a grandchild retracing his grandfather’s steps, from the train station through the gate, imagining the horror, the fear, the cold. The chill still painfully palpable. Both men turned their back to the gate and never looked back, 71 years apart. Can anyone become a photographer in the digital age?